My usually wonderfully dependable sewing machine has come alive but not in a good way. A few days ago it started this alarming behavior of continuing to sew after I’d taken my foot off the pedal. Yikes! The only way I can stop it is to raise the presser foot. Sometimes that calms it down for a bit but after a few more stops and starts it begins sewing on it’s own again! 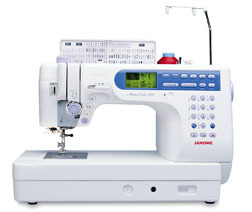 This Janome 6500 Professional is a dream to free motion stitch on. It comes with a bazillion embroidery options which I’ll never use. But it’s usually a fast, never tiring work horse. I’ll take it tomorrow to the local sewing shop where I bought it for a spa treatment/repair. Hopefully it’ll come home to me happy. This entry was posted on December 14, 2009 at 8:31 am and is filed under Process. You can follow any responses to this entry through the RSS 2.0 feed. You can leave a response, or trackback from your own site.